A triumph of colour shape and texture. 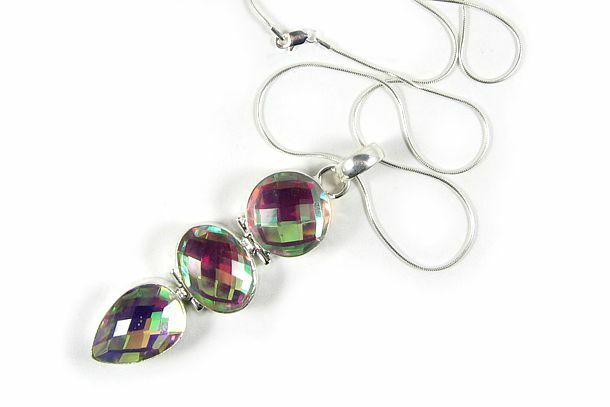 Circle, oval and teardrop shaped crystals which have been infinity cut to reflect coloured light to the max. Lime green , turquoise, gold, purple, pinks and all reflected in the myriad of surfaces. All set in 925 Sterling Silver. Comes complete with Sterling Silver snake chain and organza necklace. Size: 8.5cm (3¼") Green organza necklace 43cm (17") plus 5cm (2") extension. Snake chain 46cm (18").